This is the first installment in a series on IT service automation by Pink Elephant expert Jan-Willem Middelburg. The series follows the journey of a fictional global CIO as he realizes that his well-regarded IT organization must radically change the way it delivers IT services. The first chapter below, “Dear CIO, are you ready for the self-service generation?” describes the encounter that sets the CIO on his quest. It is 9 p.m. and you are staring out the boardroom window across the millions of lights of the city. You are looking back on a day packed with meetings… again. In the morning, you met with the IT steering committee, the risk auditors and the CFO. Your afternoon was filled with your deputy CIOs, each fighting to receive a portion of next year’s budget. It is that time of year again. As you pack your briefcase and start toward the elevators, you notice the intern still working away. A typical millennial with the latest headphones and a million devices scattered across his desk. The guy was “lucky” to have been chosen out of hundreds of applicants for the summer internship at the CIO Office and, so far, he has been a tremendous asset to your team. The speed and agility with which he can complete complex analyses has frequently surprised you, and you have already decided that you will probably hire him after the summer. You look at your watch and decide it is time to send him home. You walk over to his office and slowly tap against his screen. The intern lowers his headphones and immediately sits up straight, realizing the global CIO is addressing him. “Tomorrow’s a new day, time to go home,” you hear yourself mutter and the intern immediately looks at his watch, which lights up as he turns his wrist. The intern presses some last buttons on his machine and accompanies you to the elevators. As you ride the elevator, the silence is uncomfortable, and you start some small talk: “Having a late dinner with your girlfriend tonight?” The intern quickly looks at his phone and replies with a smile: “Dinner should be at my friend’s house in 28 minutes,” he answers. “My girlfriend is staying at her parents this week to finish the paper for her online degree, so we decided it’s better to Airbnb our place for the week.” When the elevator door slides open, you keep wondering what the guy next to you just said. Right there, at the parking lot in the pouring rain, you realize that you need to make your enterprise ready for the self-service generation. Not just for the young intern who grew up with technology, but for your customers who will also expect the services of your company to be available immediately and with the push of one button. When you reach the main entrance, you see that it is raining cats and dogs. Your car is parked in one of the executive parking spaces only a few yards away, but you see that even the small distance will get your suit soaked. At the same moment, a small car pulls up at the entrance and the intern opens the door to the back seat. You suddenly realize that the guy already booked an Uber while he was closing his computer upstairs. There’s no thunder as you run for your car, but you feel like you’ve been struck by lightning. The next morning you wake up energized. You order an Uber to take you to work, and whilst you are in the backseat of the car, you reflect on the situation with the intern from last night. Everywhere in the world, new service providers are popping out of the ground with “disruptive” business models. Spotify, Uber, Booking.com and Netflix are some of the main examples that everybody is talking about. They are able to attract massive groups of users and — like the intern — many people like to use these services, because they are instantly available with the click of one app or similar interface. As you think about this a little more, you wonder what would happen if you could make the services in your organization available in a similar way with IT service automation. What if your employees could select their IT services by themselves and order them as easily as booking a rideshare service? Is provisioning a test server really so much different from booking a driver? For years, you have worked really hard to achieve operational excellence of all global IT services. Your service catalogue is well-defined and you have consistently managed to reach the targets of your service level agreements (you became CIO for a reason…). You have a very effective and efficient Service Desk that delivers services all over the globe with high satisfaction levels. So, what is the difference between your organization’s services and the services your intern likes to use? In a traditional service model, the user interacts with the service provider at every step, from request and proposal through paying the invoice and sending feedback. 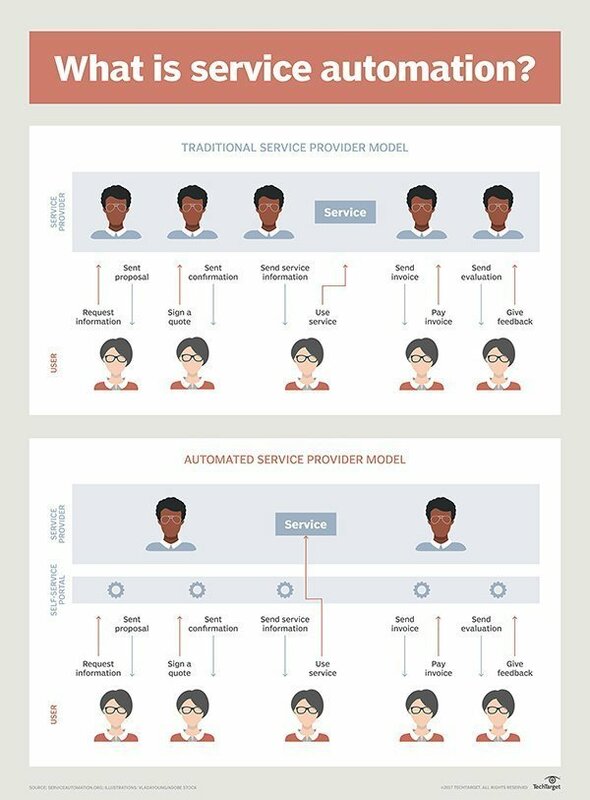 In the automated service provider model, the self-service portal — a technology layer — automates many or all of the steps. As your Uber drives into the parking lot of your office, and your driver swipes that he has completed his ride, you suddenly realize the difference: The services your organization offers are control-oriented and frequently include manual steps. The services Spotify, Uber, Booking.com and Netflix are offering are user-oriented and completely automated. The new “rules” of the workplace are being defined as computers are frantically being programmed to take the lead in the workplace, when it comes to judgment and intuition. We humans need to be the idea generators, the motivators, the negotiators, and the trouble-shooters to fix computer errors, if we want to govern our emerging digital environments. In short, we need to get closer to our firms, be more tightly integrated and intimate with work performance than ever before… which means the role and tenure of the much-derided middle-manager in the Dilbert Cartoons could be taking on a whole new potential twist – and a whole new (potential) level of relevance. I would go as far as declaring 2018 as a new beginning of the value of the full-time employee – where alignment with the mission, spirit, culture, energy and context of an organization has never been so important. We are seeing the value of contract work diminish as so much “outsource-able” work is so much easier to automate and global labor drives down the cost of getting things done quickly and easily. Business success is more about investing in the core than ever – and that core includes the people who are the true pieces of human middleware to hold everything together. The onus is circling back to the value of being a full-time employee, who needs to value the fruits of having a predictable income and adapt to the changing balance of how humans need to work with computers. Remember when the rise of the gig worker was supposed to revamp how so many of us worked, as we escaped the shackles of the “evil employer”? Almost two decades ago, the internet was creating the independent worker, as exemplified in Dan Pink’s timeless book “Free Agent Nation: How America’s New Independent Workers are Transforming the Way We Live” became the seminal guide for what is now known as the “gig worker”. Furthermore, unless recent research from McKinsey of 8000 workers can now be categorized as fake news, 162 million people in Europe and the United States—or 20 to 30 percent of the working-age population—engage in some form of independent work today. And a recent study from freelance site Upwork (which undoubtedly wants to hype the impact of gig world) cranks up the numbers even further, claiming that a staggering 50% of US millennials are already freelancing, before declaring the freelance sector will comprise the majority of the US workforcewithin a decade. Wow. So are the days of being gainfully employed really disintegrating before our very eyes? Or is the gig hype beginning to atrophy for many people? The gig economy is becoming a tough place to craft a living if many of the new reports are to be believed. And it’s not just about driving Ubers, delivering food orders and contracting for logistics firms – i.e., working for businesses that exploit the gig economy to drive down labor costs and improve services. It’s the freelance gig economy where people forge a living writing code, supporting content development, delivering consulting work on-demand etc. Even that lovely Upwork research admits: “While finances are a challenge for all, freelancers experience a unique concern — income predictability. The study found that, with the ebbs and flows of freelancing, full-time freelancers dip into savings more often (63 percent at least once per month versus 20 percent of full-time non-freelancers)”. So even if the most biased of sources admits most gig workers can’t cover their living costs, we can conclude that those “Free Agents”, which McKinsey describes as the gig worker sector using gig work as its primary income, are not in a sustainable earning situation. You only need to spend a little time on LinkedIn to observe just how many people are now marketing their wares as solo free agents, or as part of a company bearing their name. It’s abundantly clear that so many people have decided to set themselves up as independents, that the market for gig talent is saturated and it’s become a “buyers’ market” for gig work. Whether I want to commission a crack consultant to validate some RPA software, hire an analyst to endorse my product, commission a writer to produce a white-label assessment of an emerging market, produce a go-to-market strategy for my business, redesign my website, my logo, or just have someone support my business on a part-time basis… today, I am spoiled for choice. I barely need to hire fulltime employees these days, unless they are truly core to keeping my business ticking along – and I can create real competition to get the work done for much lower costs than a few short years ago. We’re not in a world rejecting human work, but a world where work is rapidly changing – and the skills of the dynamic middle manager has never been so important. In short, the increasing availability of computing power to crunch massive amounts of data, coupled with advancing tools to tag and label data and workflow clusters with breakthrough programming in languages such as Python for syntax and R for data visualization, are the game-changers that will increasingly impact how we get work done, as we develop continually smarter algorithms to keep teaching computers to do the work of the human brain. What’s more, the rapid development of Machine Learning (ML) environments such as Google’s TensorFlow, the Microsoft’s Azure Machine Learning Workbench, Amazon’s Sagemaker, Caffe and Alibaba’s Aliyun are becoming the new environments driving armies of coders and developers to align themselves with ML value – desperate to stay relevant (and well paid) against the headwinds of commoditization of legacy coding and app development. In short, the disruptive ML techniques are teaching computers to do what comes naturally to humans: to learn by example. Today’s emerging ML tools use massive amounts of data and computing power to simulate neural networks that imitate the human brain’s connectivity, classifying data sets and finding patterns and correlations between them. Net-net, pattern-matching jobs are increasingly being affected by ML – vocations such as radiologists, pathologists, financial advisors, lawyers, procurement executives, accountants etc. are all being challenged as judgment work is (gradually) being replaced by smart algorithms. However, as elements of these types of jobs are being affected, other job elements become even more important, namely interacting with other humans, creating, setting the agenda, defining and finding the problems to go after. They motivate, they persuade, they negotiate, they coordinate. They are the dynamic conduits of driving information and ideas in an organization and will be increasingly in the driving seat as Machine Learning advancements increasingly take hold. The digital middle manager who can bring a team together and lead people in the right direction does not exist and likely never will…. I’d be amazed if we saw one emerge soon. Having predictability of income, healthcare costs covered, guaranteed paid vacation time – and a constant supply of work to do – is fast becoming the dream scenario for the disgruntled gig worker. So here’s a thought – go get a JOB. Or if you’re in a job and wanted to try the gig work thing… spare a thought for what your ideal situation looks like, because last time I looked, most firms are doing everything they can to avoid hiring well-paid staff… especially if they can get the work done much cheaper from desperate gig workers. i) Become the conduit of ideas and information that is irreplaceable right across your organization. So we’ve now come full circle, where the value of having people really close to the business is becoming more important than ever, as computers perform more and more of the routine and judgement based tasks. To the point, the value of the full-time employee goes both ways: companies need people who really understand their institutional processes, their quirks and ways of getting things done… who are onhand to troubleshoot mistakes, but also there to keep the ideas flowing to keep the business ahead of its competition and close to its customers. “Human middleware” is becomimg the real OneOffice glue to break down those siloes and help govern a slick business operation from front to back office. ii) Develop a positive attitude by finding aspects of your job you do like.Your full time job is likely the best gig-work you will probably ever get, so even if you hate your boss and most of your colleagues, ask yourself if you’d prefer scrapping around for the boring work other companies prefer to outsource. Focus on the interesting stuff you can do and keep reminding yourself that the grass is rarely greener elsewhere. Unless you are a whizz at Python development, the chances are your job-hopping days are numbered and you need to figure out how to stay put and make it better for yourself. iv) Let the computers take the lead and become the controller to fix mistakes double checking, intervening when the computers do something dumb. Humans and computers make different kinds of mistakes, so we really need to bring humans and computers together intelligently to cancel out each other’s mistakes. Fighting automation and ML is a lost cause, especially when your firm is completely bought in to the concept and it rolling out bots and working on developing smart algorithms. Just let these things take the lead and them figure out how to make them functional and monitor their errors, ad computers will always keep making them. You can’t fight innovation, but you can nurture it, manage it and troubleshoot it. v) Find your pareto balance and stop whining. Nothing in life including your current or prospective employer will be perfect. Focus on the 80% that is right, versus making yourself (and others around you) miserable by the other 20%. There is rarely a perfect fit where workers only get to focus 100% on all the things they love to do… there has to be this 80/20 compromise, or you will be forever hopping around trying to find a workplace nirvana that doesn’t exist. And it today’s social world your reputation follows you around like never before… and employers are steering clear of the whiners at all costs. This time last year I wrote in these pages about the year ahead for outsourcing. The key trend I focused on was an increase in partnership with clients and suppliers getting much closer—and that seems to have taken place throughout 2017. One major driver for this has been the change in how consumers become aware of a product and then convert into customers…what marketing professionals call the ‘customer journey.’ Think for a moment about the classic customer journey. A potential customer would see some advertising or some type of marketing campaign, search for additional information, compare products, eventually make a purchase and possibly follow up with a call or email to the customer service team if they have a problem. 1. GDPR: The EU General Data Protection Regulation (GDPR) will be enforced beginning May 25, 2018. This completely changes how companies across Europe can store and work with data. It is the biggest shake-up in how companies can use data since the 1990s and essentially puts power in the hands of the customer. If you cannot tell your customer in clear and simple terms why you want to capture and use their data then you are no longer allowed to capture it – and fines in the millions will hit those who ignore the new rules. Many companies that are scared of the legislation will turn to their partners for assurance that their systems are compliant. Source: outsourcemag.com-Where Will Outsourcing Head To in 2018? When Darin Morrow took over as CIO at Cricket Wireless in early 2017, he sought to revolutionize the company’s internal operations by revamping its IT vision. Looking to establish accountability across disparate project teams? Trying to automate processes or allow for lean methodology support? Hoping to enable business consequence modeling or real-time reporting? If you answered ‘yes’ to any of these questions, then you need to download this comprehensive, 68-page PDF guide on selecting, managing, and tracking IT projects for superior service delivery. Morrow made changes to the technology the company used and how employees collaborated with each other. Communication between business and IT was also essential to Morrow’s tech strategy, especially because aligning departmental goals optimizes customers’ experience, he says. As a result of the changes, Morrow says Cricket’s IT structure defines and continuously improves internal and external business processes. In this CIO Voices Q&A, Morrow explains how bringing a startup mentality to large organizations benefits both business and IT outcomes. From a CIO strategy standpoint, what are the biggest takeaways from your experiences with implementing changes to Cricket’s IT structure? Small teams tend to become cohesive much easier than organizations. You constantly have to create small teams that can go fast, but the end-to-end organization must be nimble. To overcome that hurdle, we ‘trade players’ by taking a seasoned member of one team and trading [them for] another team member. This helps each team gain perspective from their decisions on the other team. Understanding the end-to-end architecture is key as well — training and teaching the critical aspects of the business and technology, as well as the reasonable-risk tolerance for each piece. An additional obstacle is making the correct decision when taking calculated risks. Being nimble does not mean ‘go fast at all costs.’ Customer experience and system stability are key as well. Knowing which reasonable risks to take and how fast we can go is critical. Morrow: Our ability to collaborate and make decisions quickly is critical. This is how we implement the ‘startup’ mentality. We simply get the facts on the table along with our homework and make decisions together. A give and take and partnership between business and technology makes it happen fast. Why is it important to align departmental goals to optimize customer experience, and what is the CIO’s role in pushing that alignment along? Morrow: Our goals are not technical; they are business goals. As we improve customers’ experience, simplifying the customer and user interfaces to make it simpler to interact with us, it becomes pure math: The customers are happier and the business saves money. It’s important for my team to know how all our departmental goals have to relate to the business goals and strategy. What new technologies will be most disruptive to companies’ IT structure and processes in the next few years, and why? How can CIOs tap into these technologies to improve business processes and customer experiences? The CIO sets the strategy and the vision for the organization. There is a need to clearly understand our business [and] the business goals, align our IT strategy to achieve those business goals and strategies, as well anticipate the changes in the future. With that vision, we can lay the foundation — whether it be microservices or data driven technologies — that allows us to continue to adapt and be nimble. How has the increased digitization of business changed the CIO’s role in the typical business? Have they become more involved in business strategy development?